Just in time for winter, Perkett's Coffee has a new range of self-heating gourmet coffee beverages, set to revolutionise the way Australians drink their coffee. Using state of the art packaging technology, Perkett's Coffee literally heats itself. Within six to eight minutes of activation, the coffee is heated to the perfect drinking temperature 62 degrees celsius and is kept warm for up to an hour. Super convenient, Perkett's Coffee can be heated at anytime and anywhere, making it ideal for commuters, outdoor enthusiats, sport spectators, drivers or anyone who wants a quick hot beverage and doesn't enjoy braving the morning coffee queues. To heat the coffee the canister is tipped upside down and the tamper-proof seal is removed. An activation button found underneath the tamper-proof seal is pushed in, releasing water into the inner chamber that contains quicklime. The water, when combined with the quicklime, causes a natural exothermic reaction that creates heat. This heat is transferred through the inner chamber to warm the coffee in the outer chamber. When the coffee has reached the right temperature a smal circle on the side of the can changes colour from pink to white. 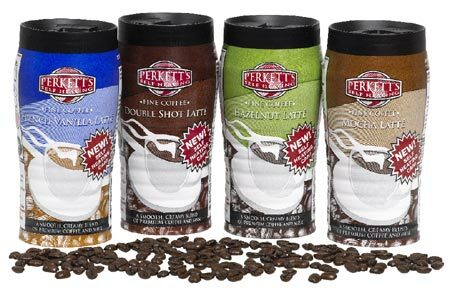 Perkett's Coffee comes in four tast flavours: Double Shot Latte, Hazelnut Latte, Mocha Latte and French Vanilla Latte and can be purchased from Coles and Woolworths/Safeways supermarkets Australia wide in a 281ml canister for RRP: $4.99. Review: What a clever idea, now no matter what you are doing you will never to stuck for a cuppa. Has a decent shelf life too. Take you Perkett's Coffee to a picnic, park, watching your kids at sport or work on sites or on the run. Great taste too.